By default, gridlines don't appear on a printed Microsoft Excel worksheet or workbook. This article describes how you can make the gridlines appear in your printed worksheets. Select the worksheet or worksheets that you want to print. For more information, see Select one or multiple worksheets. 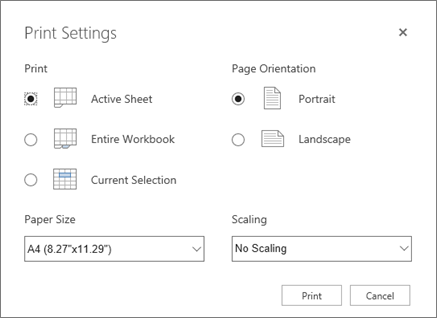 On the Page Layout tab, in the Sheet Options group, select the Print check box under Gridlines. 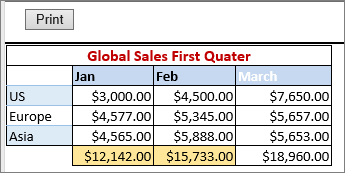 Note: If the check boxes in the Sheet Options group appear dimmed, it may be because you have a chart, image, or other object selected on the worksheet. If you cancel that selection, you'll be able to use the check boxes. Click the File tab, and then click Print. Keyboard shortcut You can also press Ctrl+P. Preview the gridlines – To see how the gridlines will print, press Ctrl+F2 to open the File tab, which displays a preview of printed worksheet. Gridlines print only around actual data in a worksheet. If you want to print gridlines around empty cells also, you must set the print area to include those cells. Or, you can apply borders around the cells instead. To learn more about these options, see Define or clear a print area on a worksheet or Apply or remove cell borders on a worksheet. 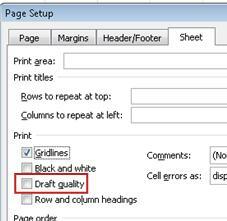 Troubleshoot printing issues with gridlines – If gridlines don't show up when you print your worksheet, or if you can't see them in the Print Preview window, check that the Draft quality check box is not selected. The Draft quality check box appears on Sheet tab in the Page Setup dialog box. For a shortcut to access the Page Setup dialog box, press Alt+P, S, P.
If gridlines still don't print successfully, there may be an issue with your printer driver. In this case, you can try downloading the latest driver from the printer manufacturer's website. As a last resort, you can apply borders around the cells that you want to print. For more information, see Apply or remove cell borders on a worksheet. 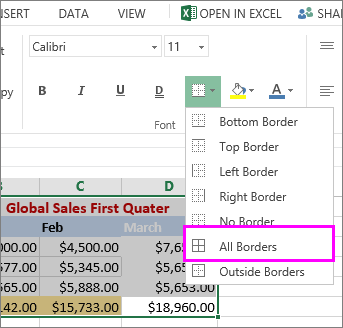 To add a border around each cell, click and drag to select cells that you want included. On the Home tab, in the Font group, click Borders > All Borders. The areas with borders will now appear with darker lines. For a print preview, click File > Print. Pick the print option you want to preview and click Print. In the preview, make sure the gridlines look the way you want them to, and then click Print. If you want to make changes before printing, click the x to close preview and return to the worksheet.